Yeah, and on Dec. 1st I am going to announce my plans to travel to Jupiter 300 times. And I am proud to be on the forefront of announcing plans that will never come to fruition. Nikola Motor Co. is revealing its Nikola One hydrogen-electric Class 8 tractor at its headquarters in Salt Lake City, Utah. The unveiling is being streamed live below. Allegedly over 600 members of the media, industry partners, customers and government leaders are scheduled to attend the unveiling. “There are many out there that wondered if we would deliver, but today we proudly show off the most advanced semi-truck ever built,” said Trevor Milton, founder and CEO of Nikola. Nikola says Ryder System Inc. will be its exclusive nationwide distribution and maintenance provider. Ryder, which has a network of more than 800 service locations in North America, will provide nationwide sales, service and warranty work. Thompson Machinery, a Caterpillar dealer and an early investor in Nikola Motor Co., also will offer sales and service in Tennessee and Mississippi. I want to learn more about its Meritor-sourced fully independent suspension. When Milton switched in mid-stream from battery/micro-turbine to battery/natural gas fuel cell, he lost me. Clearly, he didn't think things through all the way before he started his sales pitch. How damn long is that wheelbase? The minute I heard Ryder mentioned, I thought small start-up............David Hobbensiefken and his R-100 Paymaster. With US Express on board, they already have a few hundred sold. Seems incredible to me, the startup costs involved in this adventure. 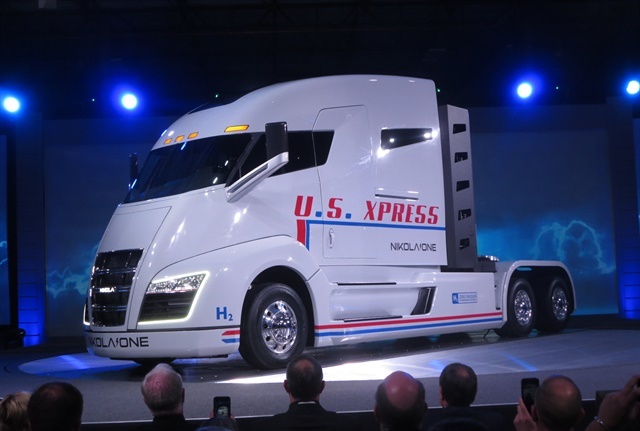 If enthusiasm ensures success, Nikola One, the fuel cell-electric long-haul tractor unveiled Thursday night in Salt Lake City, is a sure thing. A form-fitting white wrap came off the streamlined vehicle amid applause, cheers and whistles from hundreds of guests who think it might really be the game changer for the trucking industry that its proponents claim. Their cheerleader was Trevor Milton, founder and CEO of Nikola Motor Co., the start-up firm that’s designing the electrically propelled truck and preparing it for production. Milton unveiled the truck while providing details of how the truck's electric drive system will be powered by a combination of hydrogen fuel cells, lithium-ion batteries and regenerative braking. Milton said the truck will be in production by 2020, with an expected annual build rate of 50,000 units. The Nikola One sleeper-cab is aimed at the long-haul market composed of owner-operators and fleets of various sizes. A daycab version, called Nikola Two, will join the sleeper and expand the applications suited for the fuel cell-electric truck. It looks like a typical conventional-cab tractor. A Nikola vehicle’s economics appear impressive. Without an engine, transmission, driveline and axles, it should be cheap to maintain and will get double or triple the effective fuel economy of today’s diesel-powered trucks and tractors, Milton said. There'll be no tailpipe emissions; the only byproduct of the chemical reaction by which hydrogen generates electricity is water. A Nikola One will weigh about 17,000 pounds vs. 19,000 for a typical 15L diesel sleeper-cab tractor. A Nikola One will go 1,200 miles between fill-ups of liquefied hydrogen dispensed at a network of 364 stations that Nikola will build and operate throughout the United States. Fuel cost will be built into the purchase or leasing agreement, so will be supplied at no charge for a truck’s first 1 million miles. Operating software called Nikola Shipment will combine routing navigation with load finding to minimize miles traveled and maximize revenue. The software will be standard with Nikola One. So intriguing is the concept that many of those in the audience had put down $1,500 per truck to reserve one or more of them. Nikola has raised about $4 billion from the orders alone, Milton claimed. Customers include KTI Ltd. of Pulaski, Virginia, a small fleet whose vice president, Adam King, said they ordered one; and U.S. Xpress, the giant operation in Chattanooga, Tennessee, whose chairman and CEO, Max Fuller, has reserved enough that his fleet's name is emblazoned on the Nikola One prototype. “I’ve come up here five or six times to talk with them, making suggestions” on how the truck should be designed for what it must do, said Fuller. In an introductory video he declared, "I've no ownership in the company, but I can tell you that I'm pretty excited about how the company's coming forward, and how the product's coming to the market." Nikola One is intriguing, but “it must hold up,” said Jay England, CEO of Utah-based Pride Inc. “It’s got to be durable and reliable.” Whether or not it is will be discovered through real-life operations. A fully independent suspension supplied by Meritor will smooth the ride, and the silent hydrogen fuel cell and electric motors will contribute to quietness. Together the six motors will make up to 1,000 hp and 2,000 lb-ft of torque, enough for "unbelievable acceleration" and to move an 80,000-pound rig up a 6% grade at 65 mph, Milton claimed. The fuel cell produces electricity that’s sent to bank of advanced lithium-ion batteries, from where it’s sent to the motors, one at each wheel position of the three-axle tractor. Batteries are mounted between frame rails for a low center of gravity and high stability. Wheel-by-wheel torque vectoring helps in cornering. Regenerative braking sends more electric energy to the batteries, and does 85% of the stopping a rig requires. Air disc brakes take care of the rest. Milton gave no exact production date, and while guests who have placed orders are simply unsure of when they will get their trucks, they didn’t seem edgy about it. Milton did announce that the first 5,000 units will be produced by Fitzgerald Gliders in east Tennessee. Meanwhile, Nikola will build a plant with a capacity of 50,000 trucks a year, using many robotic assembly operations to minimize assembly errors. Milton and his colleagues are discussing possibilities with several states and will announce a site choice in mid 2017. Price was not mentioned but might be covered in Friday sessions hosted by Ryder, Nikola trucks' future distributors. One figure mentioned by a fleet manager who had ordered a truck was $400,000 to $415,000 each. A daycab version of Nikola Motor Co.’s hydrogen-electric heavy-duty tractor will probably be the first one to enter production, said the firm’s founder and CEO, Trevor Milton, at the conclusion of a series of technical briefings on the products on Friday morning. And vocational straight trucks might be close behind. An unveiling of a Nikola One, a streamlined sleeper-cab tractor, the previous evening put nearly all emphasis on the long-haul model. But short and regional hauling is as important and the daycab Nikola Two is simpler, he told HDT at the event’s conclusion. Daycab tractor versions would share most operational benefits – low maintenance and operating costs along with zero emissions – with the over-the-road sleeper model. Vocational markets will include refuse, and Milton said he and his engineers are already planning a chassis for trash collection. Dump and mixer trucks are likewise probable, and all-wheel drive would make them valuable in some on/off-road duties. An earlier discussion of a Nikola’s likely lifespan included observations that the electric motors and battery “don’t need air to operate,” and the motors, anyway, could be driven into water and emerge undamaged. Milton said he’s planning 6x6 and 6x4 versions of the fuel cell electric drive chassis; without front-driving gear, steer-axle wheels could cut sharper, aiding maneuverability in a number of applications. Engineers initially designed the Nikola with a gas-fueled turbine-electric powertrain, but decided to go to hydrogen fuel cells because they’re much quieter and cleaner, and require no emissions certification. A turbine version is still possible “for sale into markets where we can’t get hydrogen to,” he said. The company’s plans to build hundreds of hydrogen fueling stations will include parking and shopping areas, and facilities will be “awesome -- they will be destinations,” Milton said. Existing truck stops were considered to be part of the network, but his team didn’t think their facilities were of the quality that Nikola wants for its customers and their drivers. Production is three years away because durability testing must go through three winter seasons, and safety-related testing of braking systems and other components will also take time. As announced the night before, Fitzgerald Gliders will build the first 5,000 units and Nikola Motor will erect a factory to assemble subsequent vehicles. Ryder System will handle sales and service for most Nikolas at its 800-plus facilities in the United States and Canada. Thompson Machinery, a Caterpillar dealer in Kentucky and Tennessee and an early investor in Nikola Motor, will have rights to handle Nikolas in those states. Deliveries of the Nikola One hydrogen-electric Class 8 tractor produced by Nikola Motor Co. will begin in 2020, and the company has moved forward with plans to design a day cab, called the Nikola Two. People in trucking said the technology has the potential to change the industry. Nikola Motor Co. unveiled the tractor here in front of 600 guests, including Utah Gov. Gary Herbert and representatives from some of the country’s largest fleets. “This could be the game-changer we’re all looking for,” said Max Fuller, CEO of U.S. Express Enterprises, based in Chattanooga, Tennessee. Scott Romans, CEO of Romans Motor Freight, based in Omaha, Nebraska, has reserved 25 Nikola One tractors and plans to run them from California to Ohio. “You look around and change is coming in all aspects, and trucking is going to follow,” he said. During the unveiling, Nikola founder and CEO Trevor Milton said his goal was to revolutionize the trucking industry, and he believes the Nikola One will do that by offering zero emissions, decreased maintenance, more power and improved safety. Milton said a Nikola One pulling a 6% grade can maintain 65 miles per hour, which a diesel-powered tractor cannot. The vehicle features a motor on every wheel, so it can accelerate faster and offers shorter stopping distances. Milton said the tractor also offers increased miles per gallon, averaging 15.4. Twelve cameras provide surround vision to improve safety. The vehicle also has a lower center of gravity — two to three feet lower than a traditional Class 8 tractor — because the batteries are located in the frame rail. 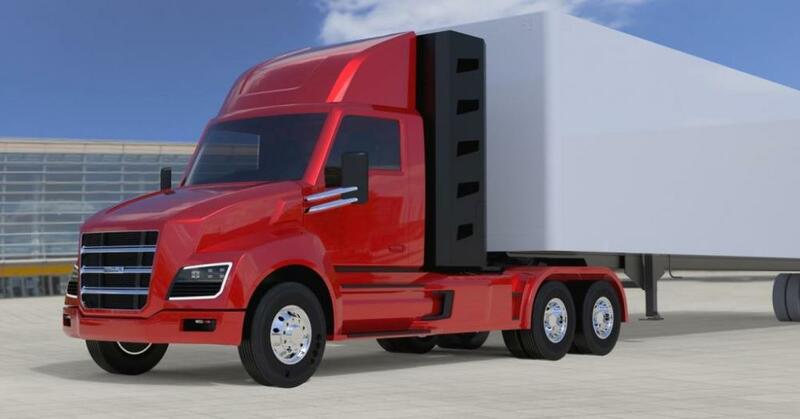 The Nikola One has the potential to increase fleets’ payload because it will weigh about 2,000 pounds less than its diesel equivalent because there is no transmission, engine, emissions equipment or drivetrain, Milton said. Romans said he expects to see a benefit from decreased maintenance. “There are fewer moving parts,” he said. Ryder System Inc. will act as Nikola’s exclusive nationwide distribution and maintenance provider. Ryder, with over 800 service locations in North America, will provide nationwide sales, service and warranty work. Wainscott said the dealership already has received interest from several fleets. “They are very excited about the all-electric solution,” he said, adding that Thompson’s ownership has always believed electric transportation was the direction the industry is headed. Wainscott said the Nikola One’s on-board power generation provides a significantly longer range than any other clean energy truck on the market today, and it doesn’t need to be plugged in or recharged. “Some people think they’ll need extension cords running to the trucks in their fleet, but that’s not the case,” he said. The Nikola One utilizes a fully electric drivetrain powered by high-density lithium batteries. Energy will be supplied on the go by a hydrogen fuel cell while delivering over 1,000 horsepower and 2,000 pound-feet of torque, which the company says is nearly double that of any semi-truck on the road. “I look at this truck as a heart transplant. Nikola has taken a reciprocating engine, driveline and transmission out and put in an on-board power generation, electric motors and batteries. This will save weight, reduce emissions, increase fuel economy and improve drivability,” Wainscott said. 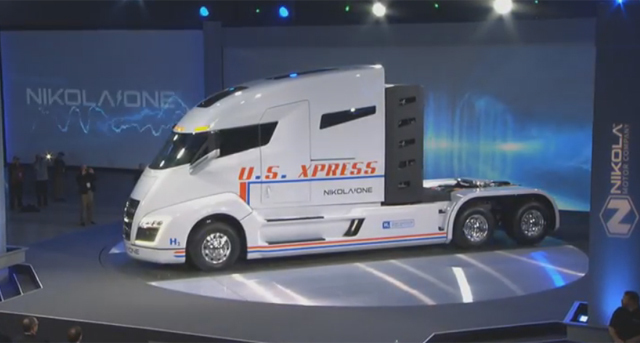 Fuller told Transport Topics the Nikola One has the potential to attract drivers and said the cab of the Nikola One is like a small apartment for drivers. “The comfort will be far superior to what we have now,” he said. U.S. Xpress Enterprises ranks No. 19 on the Transport Topics Top 100 list of the largest for-hire carriers in the United States and Canada. The first 5,000 vehicles will be built by [glider kit assembler] Fitzgerald Truck Parts & Sales, based in Byrdstown, Tennessee, while Nikola moves forward on its $1 billion manufacturing facility. Milton said the company will select the facility’s location next year. 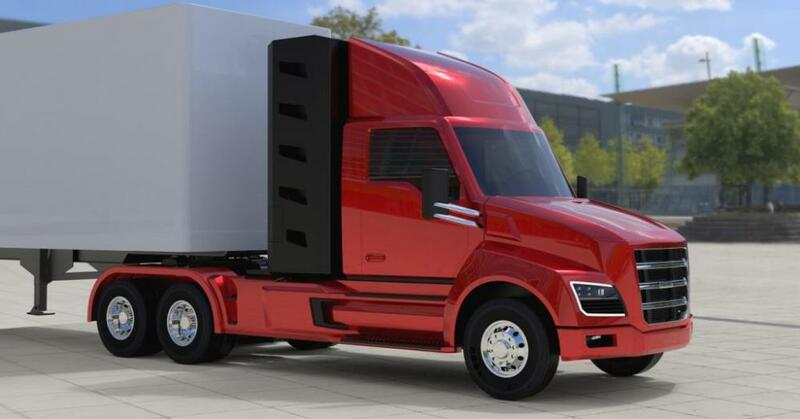 Milton said Nikola has almost $4 billion in pre-orders from about 8,000 fleets, and the company plans to release a 72-month lease program, as the truck will not be available for purchase initially. Instead, customers will lease the vehicle for between $5,000 and $7,000 a month, which includes fuel and maintenance for the first 1 million miles or seven years, whichever comes first. The company will cover the cost of hydrogen for the first 1 million miles. Nikola has plans to build 364 hydrogen fueling stations with construction starting in 2018 to support the vehicles. During the event, Milton said the Nikola Two day cab will have the same performance as the Nikola One. He also told attendees about Nikola Shipments, which would connect drivers to freight and outline the most efficient and lucrative route via an in-cab screen. “We could change owner-operator income by up to 50%,” he said. Milton assured attendees that the Nikola One is becoming a reality. “This truck will come to market. I can promise you that,” he said. Its new Nikola One sleeper tractor, expected to be in production by 2020, will include one million miles of fuel, maintenance service, and even a freight matching service in the purchase price. During the unveiling of the new Nikola One hydrogen fuel cell powered all-electric Class 8 highway tractor during a media event held here the world headquarters of Nikola Motors Co., Trevor Milton, the company’s president and CEO, told Fleet Owner he also expects it to be the first “all-inclusive” model – incorporating fuel, maintenance, even a freight-matching service, into the purchase price. Milton referred to this as a “white glove” approach to trucking. “It’s all about giving a driver all the tools they need to get the job done,” he said. A freight matching service called Nikola Shipments will be “pre-loaded” aboard the vehicle – one reason why the company is incorporating a 21-in. computer screen into the dashboard. Max Fuller, chairman and CEO of TL-carrier U.S. Xpress, told Fleet Owner he “likes what he sees” so far from this “all-inclusive” approach taken by Nikola and believes the Nikola One could be a “game changer” for the trucking industry. Fuller added that Nikola “didn’t skimp on anything” in terms of safety and driver comfort features and believes the zero-emission footprint of the Nikola One – its only tailpipe emission is water vapor – will appeal to the Environmental Protection Agency (EPA). “Every four or five years it seems we get hit with some new environmental rule that leads to equipment changes, then problems and downtime,” he said. Going to an all-electric truck “will get us away from that volatility as well,” Fuller noted. He said drivers should like this new truck as well as it is quiet, has more “instant power” so it can keep up with traffic and climb hills, with a lot more stopping power as well. Nikola’s Milton noted during the unveiling that the Nikola One is expected to have a range of 1,200 miles with a full load of hydrogen aboard, as the vehicle gets an estimated 15.4 mpg. The Nikola One’s electric motor also provides “instant acceleration,” he explained, in as little as 30 milliseconds. That power comes from the vehicle’s 320 kilowatt-hour battery pack, Milton noted. And by replacing the traditional diesel engine, exhaust aftertreatment and transmission found on today’s typical Class 8 truck with an electric motor, fuel cell, hydrogen storage tanks, and battery pack, the Nikola One ends up 2,000 lbs. lighter than a typical Class 8 diesel tractor. In terms of safety, the Nikola One is equipped with air disc brakes yet also uses “regenerative braking” to not only help stop the vehicle but “capture” braking energy and store it in its battery pack. “A typical air disc brake caliber activates in 0.45 seconds; using regenerative braking means we can activate braking power in 30 milliseconds; 15 times faster,” Milton said. That means whereas it takes 65 ft. for a typical Class 8 tractor’s air disc brakes to engage, the Nikola One can start braking in as little as two to three feet. In terms of building the Nikola One, glider kit maker Fitzgerald will manufacture the first 5,000 of them – Milton says his company has nearly $4 billion worth of pre-orders for its new truck – as Nikola builds its own $1 billion assembly plant with an expected production capacity of 50,000 vehicles. Further details about that plant will be released next year. Milton expects the Nikola One to be in full production by 2020, with a daycab version of its highway tractor – the Nikola Two – to follow. And he is not concerned about the nearly three-year gap between the unveiling of the Nikola One prototype and its expected full-production target date. Can Nikola truly transform the trucking industry? So Nikola Motors Co. unveiled its Nikola One prototype Class 8 highway sleeper tractor last week at its “world headquarters” in Salt Lake City, Utah – a truck that runs on electricity generated by a hydrogen-powered fuel cell. The company claims the Nikola One’s range is between 800 to 1,200 miles on a single fill up and, with its fuel cell linked to a 320 kilowatt-hour lithium-ion battery pack, the truck can crank out 2,000 hp and 2,000 ft.-lbs. or torque – enough to handle heavy-haul operations, which is a trucking niche Trevor Milton, Nikola’s president and CEO, is including in his marketing plans. The sales pitch for the Nikola One is pretty straightforward; indeed, refreshingly so, if the company and its partners (Ryder System being playing perhaps the most critical role handling sales, service, and warranty coverage for the vehicle) can make good on their claims. Milton said during the event that he expects to “sell” the Nikola One tractor via an “all-inclusive and integrated lease” costing anywhere from $5,000 to $7,000 per month. And by “all-inclusive” Milton means “all-inclusive”: Not only does it cover the vehicle, but all of its hydrogen fuel as well (“one million miles worth,” he explained), along with maintenance support, warranty coverage, tires, wiper blades, everything – even truck washes. Milton plans to provide hydrogen fuel and amenities to Nikola One owners through a yet-to-built network of 364 refueling “sites” modeled on the Maverik convenience store chain – making refueling a “destination” for Nikola One operators, rather than a necessary evil. Another twist Milton is planning for the Nikola One: Incorporating a freight matching service, Nikola Shipments, as part of the trucks base package of services. Truck drivers will be able to access that service via the 21-in. computer screen built into the dashboard – a computer screen that technicians can also use as a diagnostic tool as well. Of course, there are safety and environmental angles to the Nikola One being played as well. The air disc brakes on the Nikola One will be connected to a “regenerative braking” system to provide more stopping power – stopping power further enhanced through linkage with automatic emergency braking systems (AEB) such as Bendix’s Wingman Fusion and Meritor’s OnGuard Active product. The Nikola One’s battery pack, electric motors and fuel cells will all be positioned at or below its frame rails – providing more stability and a lower center of gravity to reduce the chances of a rollover. Then there are the environmental factors. For starters, fuel cells only emit water vapor, so no expensive and heavy exhaust aftertreatment systems will be needed. Milton also expects the Nikola One to last at least two million miles due to its independent suspension and electrical powertrain, with the first million miles in operation for “new owners” and the second million for those who favor buying used trucks. Even the lithium-ion battery pack can be re-sold, Milton noted: “sliced up” for use in electric back up generating systems for residential homes. “The goal here is to reuse and recycle as much as possible from the truck,” he said. Yet will trucking companies pay $5,000 to $7,000 a month for a hydrogen-powered torpedo-looking truck? And will truck drivers be willing to pilot such rigs? Sandeep Kar, global vice president for mobility at Frost & Sullivan, for one, believes total cost of ownership or “TCO” factors may play into the Nikola One’s favor. With Nikola claiming that its Nikola One prototype can offer twice the power and two to four times more fuel efficiency than an average Class 8 diesel truck, plus all the fuel and maintenance costs rolled into the lease price for good measure, Frost & Sullivan estimates that will provide savings of $21,127 per year on a lease purchase deal versus a traditional Class 8 diesel truck. And even though the Nikola One won’t start full production until 2002, the company said that it’s received over 8,000 reservations for the vehicle with deposits of $1,500 each. Milton claimed during the unveiling that amounts to nearly $4 billion worth of pre-orders – money that Nikola will no doubt use to help fund the development of its hydrogen refueling network. Will that be enough to sway truckers to start switching to hydrogen- powered electric big rigs? We’re going to find out as clock tracking the time to full production of the Nikola One is now ticking. Very interesting, there seem to be some well established trucking industry giants associated with this project. The daycab doesn't look half bad as far as modern trucks are concerned. Nikola Motor’s upcoming hydrogen-electric vehicles will eventually replace the discontinued Cat Truck products for Thompson Machinery, says the Caterpillar dealer for Tennessee and Mississippi, which will handle Nikola sales and service in those states. In February of this year, Caterpillar announced its departure from the on-highway vocational truck market as part of the company's ongoing restructuring, the dealer noted. Like other Cat outlets that had invested heavily in capital assets and personnel to service the on/off-highway truck, Thompson searched for new product ideas. "Within a few months, our team had identified a new partner in Trevor Milton, the CEO of Nikola Motor Co.,” said De Thompson V, the dealer’s president and CEO. “As an entrepreneur and leader, Trevor has an unmatched passion and work ethic to create change." Thompson therefore invested in Nikola Motor, and on December 1st, when Milton unveiled his Nikola One hydrogen-electric sleeper-cab tractor, he announced that Thompson would have distribution rights in its home states. Ryder System will otherwise be the main dealer and service provider for Nikola vehicles. The Nikola range will also include daycab tractors and trucks, to include vocational vehicles. "We are excited to announce Thompson Machinery as our only other authorized sales, service and warranty dealer, along with Ryder System, Inc. Given Thompson Machinery's impeccable reputation in Tennessee and Mississippi, we were happy to have them as an early investor,” Milton said. “Thompson Machinery has committed a tremendous amount of capital on the infrastructure needed to service Class 8 trucks and we are excited to have a partner that understands the benefits of clean technology and is ready to serve Nikola drivers," he added. Thompson Machinery will also distribute Nikola Motor’s Power Sport battery-electric all-terrain vehicle, called the Nikola Zero. It has over 500 hp and 476 lb-ft of torque and is anticipated to hit Thompson Machinery's showrooms in December of 2017. The Class 8 Nikola One and Two are three years away from production, Milton has said. “Even with a change in administration and possible adjustment to EPA's transportation regulation, we think the growing acceptability and popularity of all electric cars suggest that the market wants cleaner, more environmentally friendly transportation options,” said Steve Lainhart, Thompson’s vice president of energy and transportation. "We believe the on-highway truck industry will follow suit as soon as a truck manufacturer can bring an affordable solution to the heavy haul market," he said. "We feel Nikola is going to provide that solution and remain the innovation leader in this industry, and we are very excited to be a dealer for the Nikola Motor Co."
Nikola One and Two vehicles will use hydrogen fuel cells to generate electricity that's sent to advanced lithium-ion batteries, which then supply power to chassis motors. Regenerative braking captures kinetic energy that also goes to batteries. 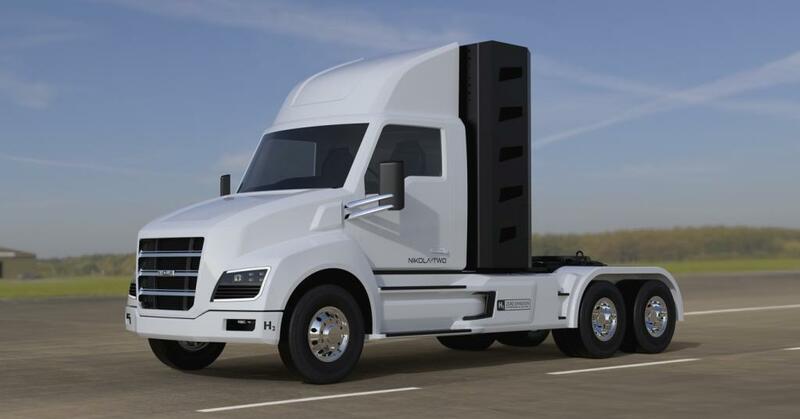 Each truck or tractor will have four or six electric motors generating as much as 1,000 hp, which will be modulated to balance propulsion needs against tire conservation, Milton explained during technical briefings that followed the unveiling. The Nikola One truck is expected to attract drivers who are interested in using its new technology, and thus reduce the problem of the ongoing driver shortage, said both companies. Other advantages include exceeding EPA standards, complying with the new brake stopping distance regulations, satisfying fuel economy needs and providing increased horsepower and torque for heavier loads and multiple trailers. 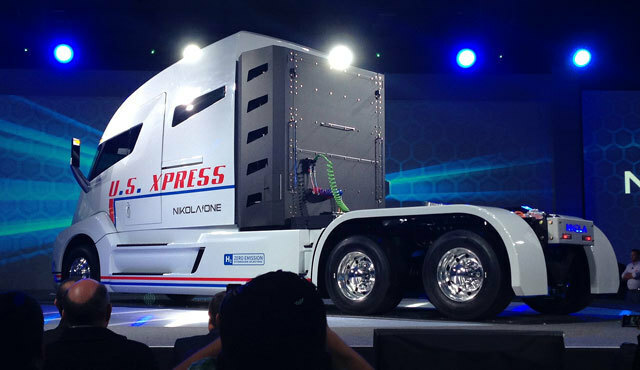 U.S. Xpress announced today that the company is one of the first and the largest truckload carrier to order the Nikola One™. The company expects the innovative zero-emission, hydrogen-electric semi-truck will be a part of its fleet when the Nikola Motor Company starts production in 2020. “Much like our recent collaboration with Freightliner and its Next-Generation Cascadia semi-truck, the Nikola One is another example of how U.S. Xpress continues to work closely with its manufacturers to identify opportunities where cutting-edge technologies and the latest advancements in clean fuels can be used to conserve more energy, lower gas emissions and reduce the overall carbon footprint of our fleet,” said Max Fuller, chairman and CEO of U.S. Xpress. “I am particularly excited about our partnership with Nikola Motor Company because it strongly positions U.S. Xpress at the forefront of the trucking industry and reinforces our commitment to having a bold sustainability program that helps preserve our valuable resources and create a better environment while still providing practical, cost-effective ways for our customers to ship their freight across the country,” said Fuller. Unveiled to the public for the first time last week, the Nikola One utilizes a fully electric drivetrain powered by high-density lithium batteries. The electric semi-truck can generate additional energy on-the-go by its hydrogen fuel cell, which will give the Nikola One a total range of between 800 and 1,200 miles with the battery fully charged and the hydrogen storage tank filled. In addition, the peak output from the electric drive system will deliver more than 1,000 horsepower and 2,000 pound-feet of torque, which is enough to accelerate the Nikola One from 0-60 mph in 30 seconds or about twice as quick as a conventional diesel semi-truck found on the road today. “U.S. Xpress drivers are going to have one of the most environmentally sound trucks on the road that they are going to love to drive,” said Trevor Milton, CEO and founder of Nikola Motor Company. “Each state-of-the-art cab comes complete with full-sized beds, large closet, full size refrigerator and freezer, microwave, television, Internet and electronic climate control." Founded in 1985, U.S. Xpress Enterprises, Inc. is the nation’s second largest privately owned truckload carrier, providing a wide variety of transportation solutions throughout North America. We are committed to being at the forefront of safety compliance, using comprehensive training for our staff and drivers and ensuring our trucks feature the latest safety innovations. With a dedication to minimizing our impact on the environment, U.S. Xpress is a SmartWay Transport Partner. U.S. Xpress affiliates include Total Transportation of Mississippi and Xpress Internacional. For more information, please visit http://www.usxpress.com. A "cab replacement program" will enable Nikola fuel cell-electric chassis to be reused "over and over again," the company's founder said, answering one of many questions answered at the launch event last month. 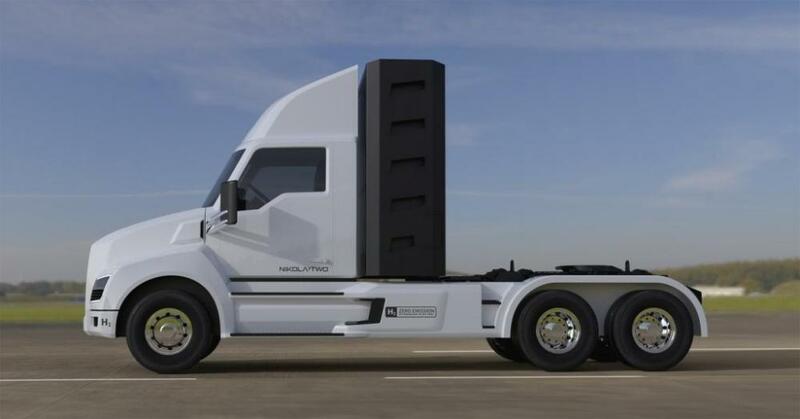 Recycling of the chassis and components is among plans for Nikola One and Two fuel cell-electric heavy trucks, declared Trevor Milton, the founder of Nikola Motor Co., during the unveiling and technical briefings early this month at the firm’s base near Salt Lake City. Many details of the development program for the futuristic vehicles were revealed by Milton and his associates on Dec. 1 and 2, some during presentations and others during a question-and-answer session. Enthusiastic but healthily skeptical people in the audience posed the questions, and most of them said they were owner-operators or owners of small fleets. A question about the trucks’ projected “life span” got Milton talking about recycling. “We will have a cab replacement program so the truck can be reutilized over and over again,” he said. The entire chassis will be reusable because the frame, batteries, electric motors, fuel cell and other parts will be rugged and long-lived. He forsees a chassis refitted with a new cab at least twice, at 500,000 and 1 million miles, at which point the truck could be sold into secondary markets. New cabs could be equipped with the latest in electronics to enhance operations and safety, including security and autonomous driving, he said. That will periodically bring a truck up to date. Nikola Motor could control this recycling process because Milton foresees most units being acquired through full-service, 72-month leases, which means Nikola will retain ownership. Eventually the chassis will be worn enough for the components to be removed and renewed or scrapped. The high-performance lithium-ion batteries could be sold in 80-kw/hour “slices” for use as energy storage units for homes, he said. These would become part of current solar-panel systems that generate electricity during the day for use during hours of darkness. Ex-Nikola batteries will still be healthy but cost less than new batteries. “The secret to long life for batteries is keeping them at a constant temperature,” he said. So in Nikola trucks, the batteries will be surrounded by an electric grid and a refrigerant jacket to automatically warm or cool them, depending on ambient temperatures. Batteries and other systems are designed to work down to minus 40 degrees. Batteries naturally get hot during operation, but cooling them extends their truck-based lives from 100,000 miles to 500,000 or more. “I’m a big believer in building something that lasts a long time,” he said. Another questioner noted that tanks for the hydrogen fuel are in an external cabinet behind the Nikola One prototype’s sleeper area. As long as you’re designing the vehicle from scratch, why not build them into the truck? To bare them for mandatory inspections, Milton explained, and to allow line-purging operations that will be routinely done to lessen chances of the gas being accidently ignited by a spark. For on-board storage, hydrogen will be compressed to 5,000 psi, about a third of what it can be, to control tank costs as well as the cost of compression, which consumes energy. How will tanks stand up in a collision? Tanks are very strong, even “bullet proof,” and will resist strikes by rounds as large as .30-06 caliber, he said. Isn’t hydrogen gas difficult and dangerous to work with? Hydrogen is as safe to handle with proper equipment and training as compressed natural gas, and safer than gasoline, which is actually rather dangerous. “Gasoline today likely wouldn’t be approved” for use by the public if it were a new fuel, he asserted. How will fuel taxes be paid? “We’re working on that,” Milton said, and it will be arranged with government authorities. The model might be California, where hydrogen fuel-cell cars are in limited use. Taxes “should be pre-paid into the lease,” along with all other operating expenses including the fuel itself, tire wear and maintenance. The 364 hydrogen filling stations that Milton intends to build to supply fuel will be “awesome” places that people will want to visit and that Nikola drivers will deserve, he said. They’ll have restaurants, rest rooms, and free truck washes. He will model them after a chain of upscale stations in Utah that have become “destinations” for the traveling public. Although hydrogen fuel will be part of a lease and thus supplied at no charge to Nikola operators, the stations will be open to the public and sold at the equivalent of $1.50 per gallon, he said. Some questions reflected basic practicality. How much damage will a Nikola One get if it strikes a deer or elk? Will a “bull bar” be optional? Designers are working on a larger bumper that will withstand such a collision and still retain aerodynamic properties, Milton said. How will a driver escape the cab if the truck rolls on its left side, where the Nikola One prototype’s single door is? Instead of one sliding door, which opens backward, as on a minivan, production models will have two smaller doors, one on each side, for improved convenience and safety, Milton answered. A dump-truck operator wanted to know if the Nikola Two daycab, which will be aimed at regional and short-hauling but also suitable for vocational use, be available with a power take-off. Yes, Milton said, and it will probably be electric. Accessories such as the air compressor, belt-driven by diesels in today’s trucks, will be electric for efficiency, and so they can be mounted conveniently. From images displayed during the briefing, it appears that the Nikola Two will have a tilting hood for access to the fuel cell and other components. Access panels on the streamlined non-tilting Nikola One’s cab and nose will make it easy for technicians to get at various systems on that vehicle, he said. How will build quality be ensured when production begins? this reporter asked. “We get that question a lot,” Milton answered. He’ll do it by hiring “bright minds” already at work in manufacturing to design the factory he plans to build. Robotic assembly will be employed to lessen mistakes sometimes made by humans. Milton and his colleagues had ready answers to these and other questions, as though they had thought through all possible concerns. That, plus financial backing from Ryder System and others, and the $4 billion in purchase deposits that Milton claims to have on hand, suggest that the Nikola Motor project will survive the next three years of further designing and testing before trucks enter production in 2020. To maintain interest in the project and satisfy the curious, Nikola Motor has scheduled an open house at 11 a.m. on Jan. 28, according to the company’s Facebook page. Lunch will be served and an RSVP is required. That will be at its headquarters on the west side of Salt Lake City. Why would the cab need to be replaced at 500,000 miles?!? Seems only to add to the astronomical expense of the unit. How many of our old diesel trucks are still on the road with millions of miles? I purchased a brand new CX in 2000 the truck is still on the road, still looks and performs well, and must be around 2 million miles with the 3rd owner. WITH THE ORIGINAL CAB and major components. Pretty good ROI I would say. "and the $4 billion in purchase deposits that Milton claims to have on hand "
Want to bet that a company bank statement to prove this will be as elusive as Obama's birth certificate.!!!! Well I haven't been paying too much attention to this until the other day. Talk about a "bold plan"! I have to say though, when you get the likes of Ryder and Meritor in on the ground floor, you have done a lot for your credibility. And the guy just doesn't let it go at building a truck! His comments about load matching and all that other stuff. Not only is he going to build you a truck, he is going to get rid of the carrier you were leased to, the broker you did business with etc etc. Not a bad looking vehicle. Beats the europeon designs by a long shot. Transport Topics / March 22, 2017. Nikola Motor Co. is in discussion with the largest truck stops and, separately, seven states as it prepares to launch in mid-2020 its zero emissions, hydrogen-electric Nikola One Class 8 truck. Also, Salt Lake City-based Nikola recently has raised $110 million in additional financing and intends to secure an additional $500 million to $750 million, says Chief Financial Officer Jonathan Spira. 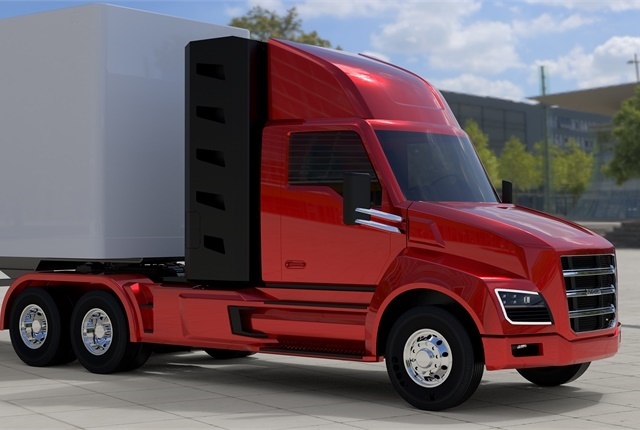 So far, Nikola has reservations for more than 8,000 sleeper trucks and day cabs worth upward of $4 billion, and projects operating costs for these vehicles will be more than 30% lower than a comparable diesel-powered sleeper cab, Spira said. Also, Nikola is negotiating with Alabama, California, Oklahoma, South Carolina, Tennessee, Texas and Utah over the location of its first production plant. In a change from the prototype truck introduced in December, the first trucks produced will not come with a 6-by-6 wheel drive configuration, he said. “It may be available down the road for vocational trucks,” Spira said. Meanwhile, the company appears to have stepped back from producing and retailing all the necessary hydrogen fuel itself as it originally announced. Nikola CEO, Trevor Milton, has reportedly suggested that today’s truck manufacturers could face the same fate as US company Kodak, whose film business collapsed during the advent of digital cameras. According to US news service, truckinginfo.com, Milton used the 66th annual meeting of the Quebec Trucking Association as a stage to point out that traditional truck OEMs are at risk of making the same mistake as Kodak. One of Kodak’s main mistakes was that it focused solely on an existing product without considering a changing environment, he said at the event. "In the event of a war, for example, the litre of diesel could reach five or seven dollars ... You'll never have to pay that kind of money to run the Nikola One." According to truckinginfo.com, Milton also compared the truck’s sales strategy – which will be based on monthly payments that include the price of the truck as well as fuel, maintenance, insurance – to Apple’s highly disruptive iTunes concept. "The other companies took a long time to figure out what was happening, and that's what's going to happen with the trucking industry," he said.